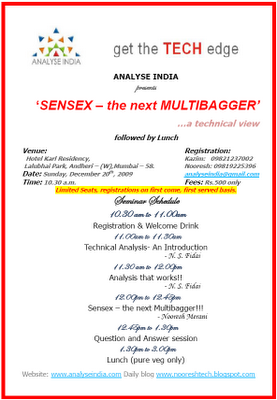 Please find attached the invite for the seminar - Sensex the next Multibagger.... a technical view which is scheduled for 20 Dec 2009. 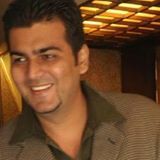 Earlier editions in Mumbai, Ahmedabad,Pune were huge successes and also we ended up discussing stock recommendations which appreciated in quick time.Interested people can contact 09821370002 Kazim who would help you out with the registration process. LnT buy on dips stop 1640 can tgt 1750 in near term. Clutch Auto maintain medium term call . Discussed before. IDBI looks good for short term buy arnd 135 stop 132 tgt 150. Long term investors can look to buy into JBF inds. Mukand and Titagarh Wagons could be in the limelight in next 2-3 weeks and appreciate sharply also. Do your own research ! 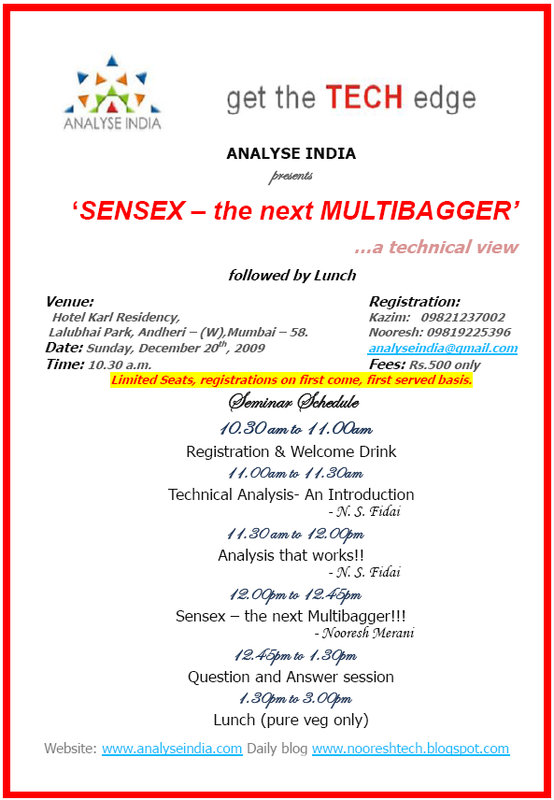 ALSO READ THE POST BELOW FOR WHY WE GAVE A BUY CALL ON MIDCAP/SMALL CAPS and maintain view of Small cap rally to continue.